I’m a Mummy of three under 6 which does not leave a lot of time for messing about with make up. However, as I get a little older (when did that happen?) and a lot more tired (night feeds) I know I look better with a little makeup help. And I enjoy it. It’s a few moments of me time in 23 hours and 55 minutes of them time. 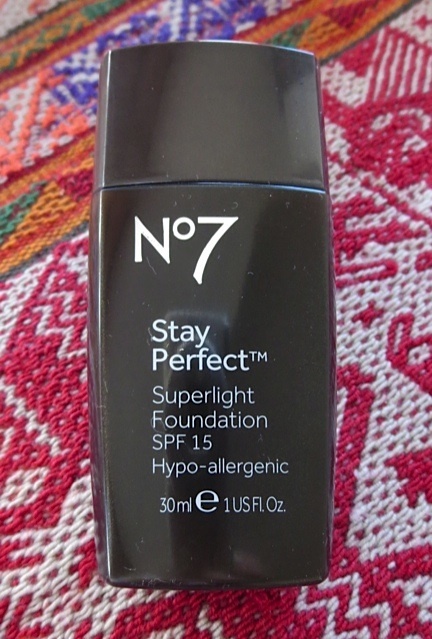 When I saw Maybelline’s new product in Boots I thought I would give it a go for two reasons. The first, it was relatively inexpensive (especially as I used my Boots points) and secondly, I liked the idea of having the pores on and around my nose erased. It did – to a certain extent. 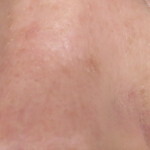 It did not erase the appearance of my pores, but it certainly did reduce the appearance of them once I had my tinted moisturiser on. (See photos below.) I was actually surprised as I was slightly cynical about its claims. I think you need to not skimp on the product application. 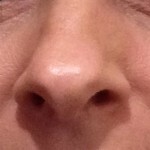 On my nose where I had applied it most generously is where the effects were most noticeable. After applying I could feel the product laying on my skin. It did not feel uncomfortable at all and was in no way greasy. In fact it felt velvety soft. (Baby Skin is a primer so I would expect it to form a barrier between skin and makeup). I have very dry skin and it did not exacerbate this at all. It made my skin feel incredibly soft and smooth and went some way to disguising any dry skin. I kept touching my face, it felt so nice. 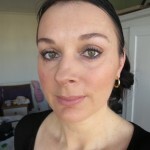 My makeup also went on more smoothly and I noticed that I did get a longer wear time out of my tinted moisturiser. As it is marketed as a primer I also used it on my eyelids and found my shadow was more vibrant and lasted longer. How long did the effects last? 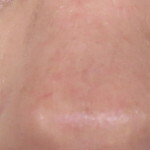 I applied Baby Skin to my face and did not put on any makeup so that I could see how long i could feel it on my skin. I felt the product for about 20 minutes. After that it seemed to be absorbed by my skin. My skin still felt soft however. I probably wouldn’t bother with it everyday as the effects were not ‘wow’ enough. But if I had a special occasion I would probably use some to help with makeup longevity and also to give a pore blurring effect. 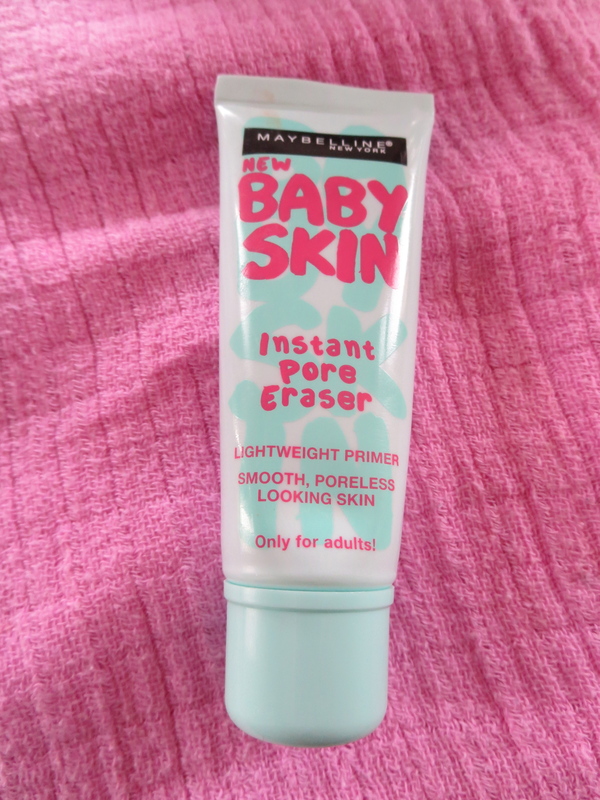 Maybelline Baby Skin Instant Pore Eraser Lightweight Primer under my tinted moisturiser. We all need to feel a little Christmas glamour especially when we usually have pureed pumpkin in our hair. Here is my style guru Lisa Eldridge showing us how to put the sparkle into our christmas makeup. A welcome life enhancing tool for us exhausted Mums! Lisa Eldridge has provided me with sooooo much enjoyment since I discovered her site over 18 months ago. GET ALONG to it fellow Mummies and do something for yourself that will give you MUCH joy and MUCH confidence. I promise a life enhancing experience! Until I discovered her, I was like so many other women – completely unsure of how to apply makeup. I had my ‘day look ‘and then my ‘going out look’, both of which were unchanged for years. Now I have an extensive and well utilised makeup drawer that enables me to create chic and attractive makeup for myself on a daily basis. Not a bad feat for a working mother of 3 children under 6 years old! PLEASE do yourself the biggest favour and check out her blog and tutorials. And I can attest from personal experience that she is the loveliest, most down to earth person. Go on – have some fun and spoil yourself. The following is from Lisa’s ‘About‘ page on her website. With over 20 years of experience, Lisa Eldridge is one of the most highly regarded make-up artists on the international beauty and fashion circuits. Whether she’s called upon to create her signature look, best described as fresh and flawless or to work her magic for the catwalk or on editorial shoots, her understated, modern approach to beauty has made her indispensable to designers, magazine editors, art directors and celebrities alike. Through her online make-up tutorials, and her role as resident on-screen beauty expert for three seasons of Channel 4’s successful series ‘Ten Years Younger, Lisa has become one of the most recognised faces in the beauty industry, both in the UK and internationally. Having previously lived and worked in Paris, New York and LA, Lisa is now based in London. Throughout her career, she has maintained a high editorial profile working with many of the world’s top fashion photographers including Regan Cameron, Solve Sundsbo, Patrick Demarchelier, Thomas Schenk, Paolo Roversi and Horst Dirkgerdes. Her masterful make-up artistry appeared on the pages of virtually every fashion magazine including British, Italian, Chinese and Japanese Vogue, Allure, Glamour, Elle, Numero, Pop and Lula. In addition, Lisa has collaborated with many of the world’s top fashion houses on their advertising campaigns and fashion shows including Chloe, Alberta Ferretti, Prada, Donna Karan, Moschino and PPQ. The list of celebrities she has made-up reads like a who’s who of the world’s most glamorous women including Kate Winslet, Katy Perry, Keira Knightley, Emma Watson, Eva Green, Cameron Diaz, Amanda Seyfried, Kate Moss, Helena Christensen, Cate Blanchet, Demi Moore and Salma Hayek. Continually quoted on the pages of the glossiest magazines, Lisa’s expertise has become highly prized over the years. In 1998, her authority was officially recognised by industry giant, Japanese make-up and skin care company, Shiseido who approached Lisa to work on developing the concept for a new make-up line. Designed and developed with Shiseido, Lisa collaborated on everything from shade and texture formulation, to packaging and new product development. 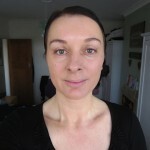 “The experience of working on my own make-up line really completed the circle of my career, and has lead me to fully understand make-up from the inside out having applied it, designed it and learnt how it is made and sold,” says Lisa. This was followed by another coup, when Lisa was head-hunted by established British cosmetics brand, No.7, and appointed as their Creative Director in 2003, a post she still holds. Working on the re-design and re-launch of this cult brand, she was responsible for bringing No.7 cosmetics back into the limelight. Using her vast experience in product development, formulation, colour, design, consultant training and P.R., her role has been key in the brand’s reinvention and global expansion into Europe, the US and Far East. What sets Lisa apart from her peers is her innate ability to translate trends, and then to communicate them through her expert make-up tutorials (created in her own studio) and blog posts. The tutorials brought her to the attention of Chanel, who asked her to collaborate with their Creative Director, Peter Phillips on Chanel’s “Make-Up Confidential,” a monthly digital magazine for which Lisa creates content. 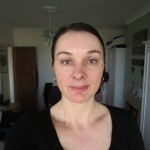 Most recently, Lisa has been commissioned to write a monthly column for BritishELLE, entitled “The Beauty Guru”, where she will sharing more of her aspirational and accessible make-up know-how with the readers.